Page 4 from the July 28, 1950 issue of Mount Holly News. 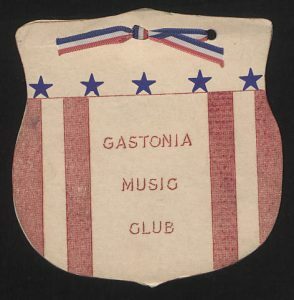 The cover of the Gastonia Music Club’s 1942-1943 yearbook. A batch of new materials from our partner, Gaston County Public Library, is now available on DigitalNC. The new materials include club yearbooks, high school yearbooks, selections from the newspaper Mount Holly News, and informational pamphlets and programs. The club yearbooks include yearbooks from the Gastonia Women’s Club from the 1920s through the 1960s as well as a yearbook for the Gastonia Music Club, and the Gaston County Medical Society. Other booklets include a program for the 1945 Annual Horse Show, the Lions Club Thirtieth Anniversary Program, and a Gaston Memorial Hospital Informational Booklet. Selections from the paper Mount Holly News come from a commemorative bound volume created in 1970, and includes a few pages of each issue of Mount Holly News from 1950. 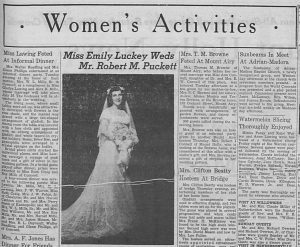 The selected pages tend to include the issue’s front page and “Women’s Activities” section. Yearbooks from the 1960s at schools such as Dallas High School, Mount Holly High School, Highland High School, and Hunter Huss High School are now available as well. To see more materials from our partner, Gaston County Public Library, check out their DigitalNC partner page, or take a look at their website.